I don’t really have any pictures for this post, so here we are in Mexico where I worked extra-hard to get my cold. Hello friends! Today’s post is going to be a short one because we’ve been hit with some beautiful weather here in Toronto and I want to get out for a walk before my night class. I’m going to share with you something my sister and I affectionately call “special drink” and which was invented after last year’s trip to Cancun where a few too many adult beverages left me sans voice and with a killer cold. So with a vague knowledge of herbs and a lot of guesswork, I looked in my spice cupboard and special drink was born. The armrest of my couch is testament to how often I drank this stuff during the winter as it is stained a nice bright yellow thanks to one of our special ingredients. Anyway, when I got back from Cancun, I drank about 3-5 cups of this a day for about 3 or 4 days (it’s a little blurry now since it did happen all the way back in February) and by the end of day one my voice was mostly back and my cold was cleared by day 4. I’ve since shared it with friends and family to varying degrees of success, so if you feel a cold or flu coming on, try pounding back a few glasses of my special drink on an empty stomach throughout the day, in addition to laying off the booze, fast food, sugar, and junk to see if it helps. Coconut oil: I tend to include coconut in a lot of my cooking, and for this hot beverage I include the oil for its capric acid, one of its medium chain saturated fats. This fat has antiviral and antimicrobial properties because it is converted to a substance called monocaprin in the body, which fights various bacteria, viruses, and even Candida albicans. Turmeric: I’ve also discussed the health benefits of turmeric, notably its high antioxidant capacity. It also supports phase 1 liver detoxification, which is important when you’re sick (and always really) because it helps remove toxins from your body so that your immune system can fight the cold/flu and not the environmental toxins you’ve ingested/inhaled/absorbed. Finally, this bright yellow spice (and the reason for all the stains on my couch) is a great anti-inflammatory, antiseptic, and antibacterial. All of these great actions will help support your body as it fights off your cold or flu. Cinnamon: The volatile oils in cinnamon, which are responsible for its pungent and delicious scent, also have great antimicrobial effects to help ward off bacteria that may be weakening your immune system. Raw, unpasteurized honey (not the stuff that comes in the shape of a bear) has tons of great health benefits. It is a form of sugar, so you don’t want to go too crazy with it, but including small-moderate amounts in your diet can have antimicrobial, antiviral, and antifungal effects. It can also have antioxidant properties and help strengthen your immune system, which is a fantastic benefit for the current cold and flu season. Not to mention it’s delicious and it can come in all kinds of different flavours depending on what flowers the bees were mostly pollinating. Look for raw or unpasteurized on the label, or go local! 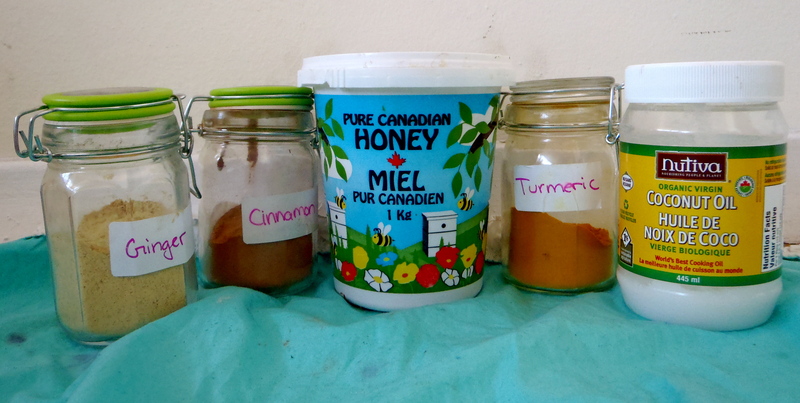 Most farmers’ markets have at least one or two vendors selling their own awesome honey products. Ginger: If your cold or flu comes with a sore throat or fever add some grated ginger to your tea. Its volatile oils help promote perspiration, and so cool the body when you’re suffering from a fever. It has also often been used by individuals suffering from upset tummies, so combined with our antimicrobial, antifungal, and antiviral ingredients above, it can really round out this bevvie to pack a full cold-busting punch. Combine ingredients in a large mug. Add boiled water and cover for 5-10 minutes so the volatile oils don’t escape. Drink on an empty stomach making sure to stir before each sip (if you don’t you may end up with some gloop at the end, and no one wants to drink that). Make sure to brush your teeth afterwards so the turmeric doesn’t stain them. There you have it folks! My go-to cold and flu bevvie. It may not be the most appetizing (I love it, but some others may not), but I’ve had great success with it in the past. Now time for some fresh (well as fresh as you can get in DT Toronto) air. Thanks for stopping by and have a whimsical day!